This is the last of my Series 1 Mixel reviews for the moment. I still have to track down the last three, if they're even available in my local area. Bag. MSRP is $4.99, which is a Price per Piece of $0.10. Parts.I really like those textured Slopes in the top of the picture. Only two ball joints but four of the Bracket 1x2 - 2x2 Inverted though. One Plate, Modified 1x2 w/3 Teeth (Claws) which I'm beginning to really like, four 1x1 Clip Plates Horizontal, and two 1x2 Plate w/Bar (closed ends) catch my eye along with the Large Jumper and Boat Stud. another one a little later after I disassembled this one. Score: +15 (A). We have our first less than perfect score on a Mixel set. We continue with the Mixel Review Week. Parts. There are a lot of Plates and Modified Plates in this set. Only two ball joints though. Two of the new tooth pieces as well. Honestly, although it has two of my favorite piece -- 1x2 Plate w/Bar (open ends) -- I'm not that thrilled with the selection in this Mixel set. pods) / 2Rh (flamethrowers) / 1B (back armor panels) / 2W. Score: +20 (A+). We max out the score on a Mixel set but, this one barely squeaks through. In an effort to catch up on my Mixels review -- the 3rd wave is being released shortly -- I'm going to try and do a week of Mixels reviews. Parts. Clip plates -- vertical and horizontal -- some radar dishes, two new headlight bricks, three new inverted brackets, small "bows", ball joints -- male, female, and hermaphrodite -- and a ton of cheese slopes. All that plus that neat lightning piece and a bunch of other parts make for a pretty good selection. A Friends review! I believe this is the first one I've done. Hopefully not the last. a price per piece of $0.12. Parts. I'm going to be honest. The only reason I grabbed this set was the Tan 1x1 Cone w/Bar piece there in the middle of the picture. It looks like it would make a perfect gun muzzle Since this set was released, it has become available in Black in some Mixel sets. Score: -15 (C). I picked this up because it was on clearance at 50% off and I wanted one of the pieces. A new web app for Mobile Frame Zero: Rapid Attack has been released. Developed by Blorf on the Hangar, it has four components; Asset Tracking, System Simulation, Rules of Engagement, and Loadout Archetypes. I managed a sneak peak and it looks pretty good. Go check it out. As far as I can remember, I grabbed this for 80% off during the recent Toys'R'Us Color Clearance sale. Box. Yes, I know, Blurry. MSRP is $7.99, which gives us a Price per Piece of $0.22. Ooouuuch. it lights up when a circuit is completed with the neck stud. Parts. Those four white angle bracket parts in the middle of the photo are why I bought this set. There are two 2x4 Inverted Slope pieces, two 1x1 Trans-Red Smooth Round Bricks, and two 1x6 Male Hinge Plates that could possibly be useful. Beyond that you have two 6x6 Female Hinge Plates, a bunch of other plates, and the ubiquitous Kre-O brick. Score: C (-15). Honestly, this could have gotten a B- but I don't think it deserves it. Even saying one Kreon is good for 4P scale is pretty weak. I only grabbed this because it was dirt cheap and I knew I could use four of the parts in it. Scrape, over on the Hangar, has released a massive compilation of instructions. It contains 66 sets of instructions and is quite large. Although there are a few instructions that have already been published, there are a number of new ones. There is also a second pdf with all of Neoaez. Which is good because people were complaining that the links to his files were broken. Enjoy! Okay, it's Friday and I'm feeling a little lazy. So here we go with another picture post. Enjoy the weekend. Micro Zoo 1 by Peter Thaler. They don't really match 7P scale, and the scale between each creation is a little wonky, but they look really neat and they would be a fun addition to any game table. some really nice techniques on this truck. Ernie drove the fastest milkcart in the West by Karf Oohlu. This is closer to 4P scale but, there's some serious NPU in the cab design. 6P scale and there's a set of video instructions to boot. I bought this one at K-Mart on a Clearance sale as opposed to Marshall's like the last one. Box. MSRP is $11.99. Price per piece is $0.17. Instructions, Promo Material, and Data Card. Minifigs. The clear one is a hard plastic different from the regular one. It only has eight points of articulation as opposed to 12 for the normal one. female connector on the left hand side is really interesting. Parts 2. Those Jumpers actually have a hole all the way through. The tiny pieces of tubing for holding 3mm shafting, Pneuma-Ts, etc. are pretty interesting. I like the different Cheese Slopes too. Parts 3. Okay, this is a smorgasbord of parts. Just look at them all! Parts 4. Here we get to the reason the PpP is so high. Complex pieces like this will drive up cost. Score: B- (-5). This is another one that's a parts set. It's got some good accent pieces but, beyond that, there really isn't any heft to this set. 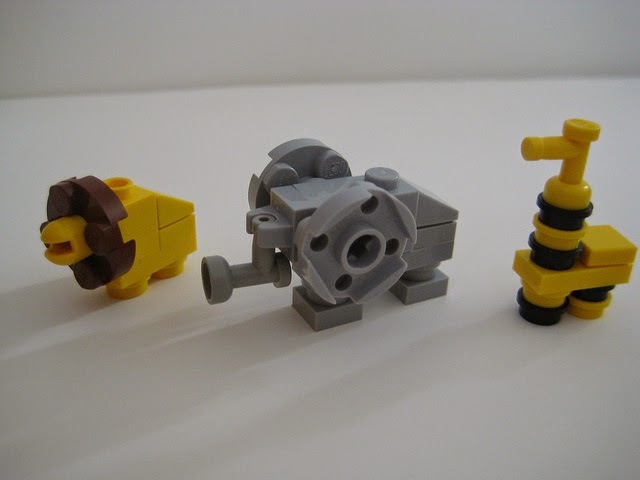 The minifigs could make a couple 4P figures and there are instructions to build a structure that could make a decent station but, beyond that there's not much. I found a few Halo sets at Marshall's recently. So I figured I would review them. 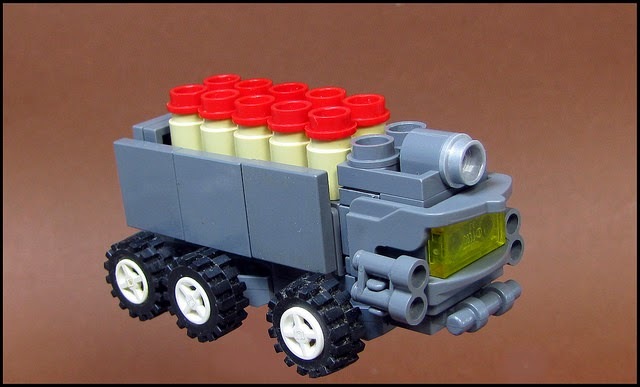 Minifig. This guy has 11 points of articulation, and look at that club! Here he is in comparison to a Classic. Parts 1. Those 1x1-1x1 brackets are interesting. As are those studded slope pieces. Parts 2. I see a bunch of accent pieces here. The "I-Beam" plates are always interesting. Score: B- (-5). This one is really a parts set. It's got some good SNOT and accent pieces but, beyond that, there really isn't any mass to this set. The minifig could make a really good looking 4P figure but there's only one in the set. Now we start the Autobot Combiner sets. Box. MSRP is $9.99 Price per piece is $0.13. Kreon Air Raid. Clip-on and plug-in wings, along with the neat little clip-on SSRs, the 1x1 Round w/Vert. Bar, and the 1x1 Plate w/Double Bars (closed ends) are all cool pieces. You may be able to use the helmet as the nose cone to some sort of giant rocket. 2nd from the left in the middle row is a 1x1 Round w/Vert. Bar. Kreon Silverbolt. That 1x1x2 Cone piece is pretty interesting. 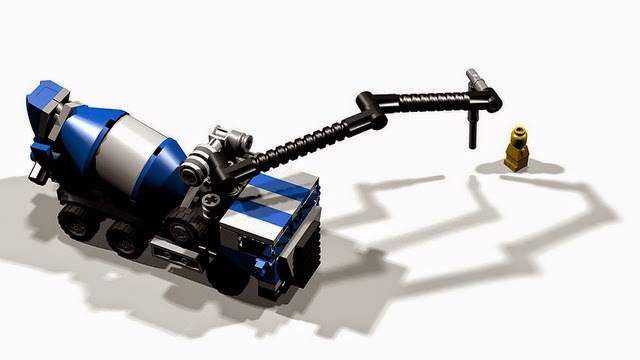 And, as always, I like the Kreon bazooka piece. Kreon Skydive. The usual suspects here. Parts. I'm having fun experimenting with those Black and Grey pieces that are used to make the Combiner form. I came across this on Clearance at Target for $14.98 a few weeks ago so I decided to give Ionix another try. Box. Parts count is 148 pieces. MSRP is $29.99 which yields a $0.20 price per piece. Tenkai Knight 1 Parts. I like the shield and that Trans-Blue piece. The 1x2 Plates are double studded and thinner than their Mega Bloks counterparts. This is what he looks like assembled. Tenkai Knight 2 Parts. The guns look cool. severely just to get him to stand up straight while dual wielding. Here's a comparison of the first one with a Classic. As you can see they fit nicely at that scale. Parts 1. Wow, that is a lot of textured bricks. The mold costs on those must be expensive. The Trans-Red chains are nice. They fit into Clip tiles. Parts 2. The tank treads. Parts 3. 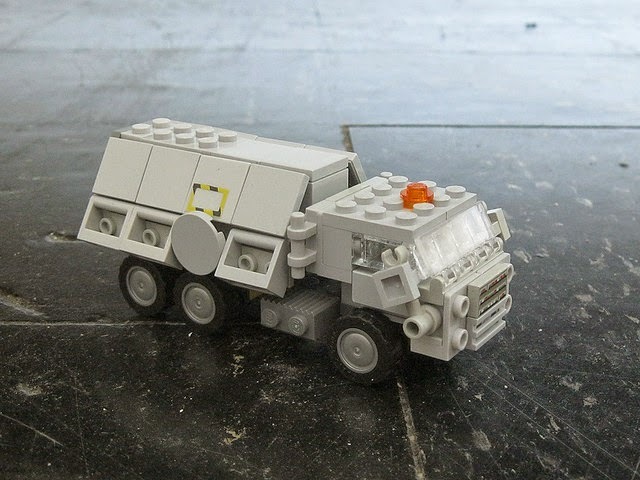 Missiles, Missile "launchers", and the main body brick. Parts 4. A lot of plates. Parts 5. Some basic bricks, more textured bricks, and a few modified bricks. Parts 6. Some brackets, clip plates, bar plates, and tiles, along with more double sided plates. Parts 7. More textured bricks, a couple slope bricks, and a few wedge plates. Here's the main body opened up. Here's the loaded missile "launcher". Score: B+ (+5). That's a lot higher score than I expected. I should still do a SSC from this to see what can really be built from the parts.